Hey hey Youtube, this is GamerCory, today I’m coming back playing some Clash Royale. Today I actually have a brand new deck here for you, let’s go ahead and take a look at what deck I’m actually gonna be using. It’s fairly similar to some of the decks that I’ve been using in the past with a little bit different variation. I’ve been able to push up to about 4,000 trophies, highest were about 4,100 or so, but this is the deck that I’m currently using. It’s doing not too shabby for me using the skeleton army, minions, the ice golem, the log, the hog rider, elite barbarians, fireball and zap, that is the deck that I’m currently using. The beauty about this game in some of the updates that have been going on and the cards that have been added is there are literally just thousands of different combinations that you guys can actually choose from. And if you go to the Top Royales here and you can see just kind of start clicking down on some of these, their decks, they are hugely diverse. And we can take a look at this one, and we got the normal skeletons with the expo, but then see it’s just completely different. I have noticed that a lot of people have actually been using just the one elixir skeletons lately, which is actually kind of crazy. So obviously the top four players actually are using the one skeleton elixir playing card that was actually updated in this last update. So let’s go ahead and get into a few replays and show you what this deck can do. Alright so we’re playing against Dolby? Dark? Dulce? I don’t really honestly know. But anyway the reason that I wanted to show you this deck is this is a very popular deck. It is the lava hound tombstone deck with a elixir collector and there is just a lot of stuff going on. Obviously, I take advantage of it right off the bat because he places a pump, and that is gonna give me a lot of opportunity to get that tower down to 329 in that first push. So he’s got a mini pekka, minions, and the princess coming in. I destroyed the princess with the log, it kind of distracts the mini pekka. I’m gonna go ahead and fireball that ice wizard there, and my skeleton army will go ahead and mop up the rest. So since I actually just used my fireball that was actually not well planned on my part, just because he’s able to actually get the two pumps down. Now he is gonna have a huge elixir advantage until I can get that fireball to come back around. So he’s gonna go ahead and put that tombstone as a distraction. I’m able to get my ice golem and my hog down. My hog’s gonna get one hit on that tower. I zapped complete not knowing, I shouldn’t have done that at all just because my ice golem would have been able to take out the skeletons in that deck. Now he’s got a nice incoming push, I’m gonna go ahead and log out the mini pekka and that princess but they’re really is nothing that I can do to make this tower survive. So right he’s actually got a very strong push coming in. I’m gonna kind of distract with my ice golem there, try to do the best that I can and then I’m gonna go ahead and put my minions down. I’m gonna zap a little bit. That mini pekka will get three hits off getting my main tower down to 1,672. So obviously you guys can see here that I’m actually making a few different mistakes but I got the minions on that tombstone. He does have level 12 minions and he’s gonna put that lava hound down right away as to get my towers distracted on that lava hound instead of the minions. So that was very well played on his part. I’m gonna use my minions to kind of get everything out of here, and there’s my second crown. Just kind of distracting him with everything he’s got just so I can push down that left lane. I’m gonna go ahead and fireball that, that’s gonna mop up that. The mini pekka will actually get almost two swings, he was mid-swing to get my tower down. I think if he would have actually hit my tower that would have been game over for me. He does a nice job of distracting, my log misses those skeletons unfortunately. I got little lucky on that, I was able to do some distraction. But I almost get his tower completely out, and I do get it down to 314. So if he would even had a little bit of the slightest push I probably would have kind of mopped it up there with that skeleton army and the ice golem going in for that final kill. So let’s go ahead and jump into another replay. Alright, so we’re playing against Messi 10. Obviously a reference to soccer player. Go ahead and do that, that was kind of stupid. But anyway, we’ll go ahead and put the ice golem down, we’ll put the hog rider behind it, followed by the minions. He’s gonna use the inferno tower as a distraction and same with the ice golem. And unfortunately does a pretty good job at mopping everything up, my hog rider’s actually only gonna get one hit. I’m not gonna do anything against his mini pekka coming in. Mid-swing again, and I’m able to kill it off. I got really lucky there, otherwise that would have probably been 400 damage to that tower there. I’m gonna put my ice golem in front of the elite barbarians there to get a nice push. He does a nice job at distracting my elite barbarians with that miner. And then again with that ice golem, so very well played on his part. I’m gonna go ahead and get those level 10 minions out of here. They only take two shots with my towers. He zapped way too late, his hog rider’s only gonna be able to get one hit. He doesn’t have enough elixir to do really anything against my hog. And my hog gets that tower down to 609. That miner comes in kind of late-noticed and I have all air, so that miner is going to get taken out pretty easily. 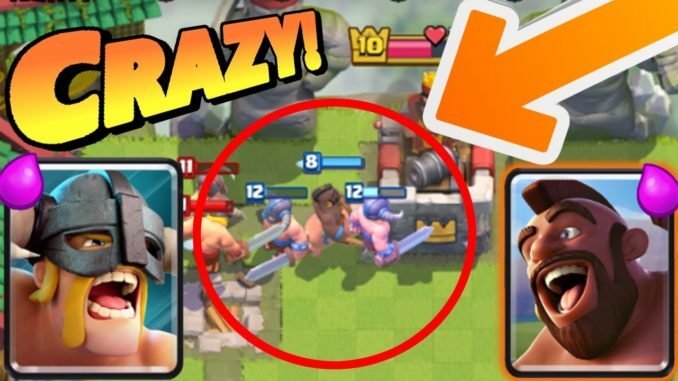 So now we have level 10 minions against level 11. I’m gonna zap that and I’m able to get that zap and that minion on that tower to get it down to 430. So I’m gonna go ice golem, I’m gonna go hog rider. He’s gonna use the inferno tower and my hog’s gonna do some nice hittin’ against this tower, this inferno tower to be exact. Not even half done, my hog’s gonna get there, two hits and that tower is done for. And now we’re on the main tower, we’re getting two swings getting it down to 3,814. So now as you can see I have a nice advantage. I don’t want to waste too much elixir. Just because I want to keep the pressure on, and he’s gonna do a nice job, and I’m gonna log that mini pekka and get a little bit of that tower there. He’s got minions coming in with a distraction of the miner. That’s a pretty hot combination lately. So I’m gonna go ahead and zap that and he’s gonna do a really nice job of getting my tower down nice and low, down to 391. So that was a nice strong push. But I do get his tower down to 1,376, so he’s got the ice golem with the mini pekka behind that, it’s gonna take out my minions pretty good with a zap and that ice golem. But my fireball is able to take the rest of that stuff. And I don’t know why he honestly used the miner if he thought it was gonna distract there but it does a good job with that inferno combination with that inferno tower and the miner to get the rest of that hog out of here. My elite barbarians will take out that miner basically just as easy as pie. So I’m gonna go ice golem and I’m gonna go hog rider, the hog rider’s, look at this, getting one, two, and three hits against that tower getting it down to 355 and I’m gonna go ahead and fireball it and log. What? Only four damage left, are you kidding me? What is going on? I get lucky I put down that ice golem, I had a zap in reserve, otherwise that push right there with six minions, a mini pekka and a miner coming in, that might have been the end of me. But as my tower still had 2,860 so I don’t know, so I’m really thankful that I had the zap in the lineup and I’m really thankful that I had the ice golem as a distraction. Let’s get back to the main menu here real quick. Alright guys so this is the deck again that I was using. Obviously I love the ice golem as a distraction card, I put it down in front of cards, like I put it down in front of the elite barbarians or the hog rider, or sometimes even in front of the minions so that I can get some nice air damage as well. You can throw it down if incoming solo musketeer is coming and you can throw it off to the side and use it as a nice distraction card, right before the musketeer locks onto your tower throw it down and then it focuses on ice golem and you can take out the rest of that musketeer with your tower pretty easy. Same with pretty much any other card that’s out there like the ice wizard or the mini pekka, it does a really nice job at distracting and then you can get cards to go across the playing field if you lay them down right. Anyways there’s a lot of different variations that you can do with this deck. I recommend that you guys try it out. If you guys don’t have the log, I don’t know I featured the log in a lot of my decks, I’m still trying to get to level two log, I need one more and I can actually go ahead and upgrade it to a level two. Then it’s probably gonna be in all my decks repeatedly because I absolutely love that card. But honestly if you don’t have it I would probably recommend the fire spirits or the archers maybe or even the bomber. Something like that, you could even go with the dart goblin. Something that’s a relatively cheap card that’s actually gonna do very well. And honestly if you really wanted to you could probably even put a defense card in there like the cannon. Or if you wanted to get really rebellious and you wanted to throw in the clone spell you could go ahead and do that and especially if you get locked onto a tower and they’re focuses on the main card and you can clone it real quick and still have a lot of damage left on your main guy, whatever that card may be, you can actually go ahead and take out that tower pretty fast. There’s a couple different variations that you could do with this deck. Just go ahead and try it, tell me what you guys think about it. Honestly don’t forget to like, comment and subscribe down below, let’s push up to that thousand subscriber mark. I know that I was up to almost 20,000 subscribers on my other channel so let’s do this on this channel and let’s just kind of push for the future. Let’s just do it. We can do it. Come on guys, let’s go ahead and share this. So go ahead and share all your favorite social media websites as well, it helps me out a lot and is greatly appreciated. But until next time YouTube, you guys keep doing what you’re already doing, and you guys stay gaming.